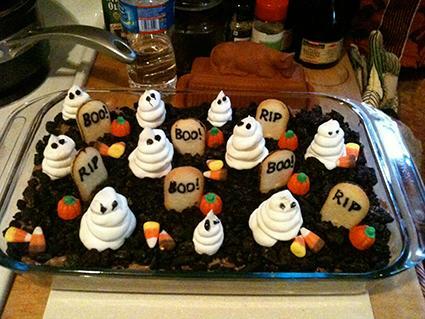 Dirt cake recipes are usually quick and easy, so whip up one before your next Halloween party. With a few festive decorations, they can be party-ready in no time. Use a basic dirt cake recipe to create your base, and then decorate the cake with one of these fun and festive ideas. 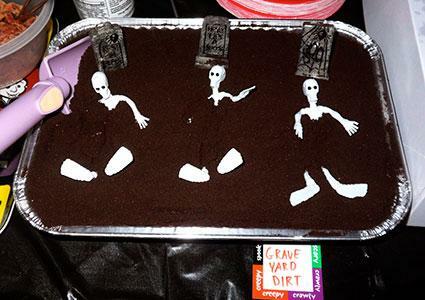 Scary skeletons are the perfect topping for a dirt cake. A large skull ups the creepy factor. Melt white chocolate according to package instructions. Pour into the skull mold and allow to harden. Carefully remove the skull from the mold and place on one end of the cake. Add small candy bones across the rest of the cake. 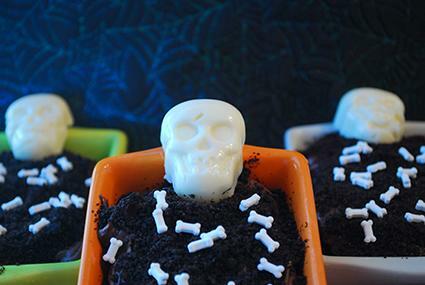 Go beyond a traditional graveyard cake and make one featuring skeletons emerging from their resting spots. Melt the white chocolate candy discs according to package directions. Pour into the skeleton bones candy mold. While waiting for the skeletons to cool and harden, place the tombstone toppers on top of the cake as desired. Carefully pop the skeletons out of the molds. Tuck skeleton parts into the dirt on top of the cake as desired. Pumpkins grow in the dirt, so feel free to turn your cake into a patch full of the iconic orange gourds! Add green buttercream frosting to the decorating bag and attach the round decorating tip using the coupler. Make a random pattern design on top of the cake to resemble gourd vines. 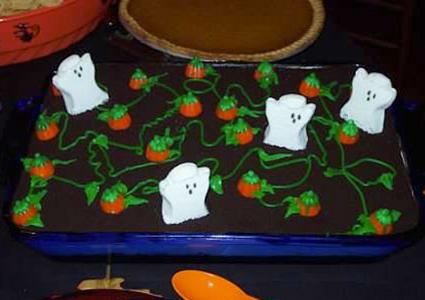 Place the candy pumpkins sporadically across the cake, on top of the green vines. Replace the round decorating tip with the leaf decorating tip. Add small leaves near the pumpkins and on the vines. Place a few ghosts throughout the patch if desired. Fat frosting ghosts are virtually effortless decorations that can be added to any cake, whether you opt for a haunted house cake or a dirt cake. Add white buttercream frosting to a decorating bag with coupler. Add the large round decorating tip to the bag. Select a spot on top of the dirt cake for your first ghost. With the tip pointing straight down, make a large round mound of frosting. Allow frosting to set for a few minutes. Once frosting is set, add a second smaller mound to the top of the first. Repeat adding mounds until your ghost reaches the desired height. Add more ghosts to your cake until you are satisfied with the number. Allow the top ghost layers to set. Fill the second decorating bag with black frosting (royal or buttercream) and add small round dots to the top of the ghosts for their eyes. Add candies, cookies, and other decorations to the cake as desired. Dirt cakes, especially those with pudding in the layers, do not have as solid of a base as a regular baked cake. Therefore, decorating with easy ideas that are lightweight and easily fixed if they shift makes the most sense for topping this style of cake. However, you still want to be careful when transporting your cake from the kitchen to the party so you don't have to do a lot of fixing upon arrival.